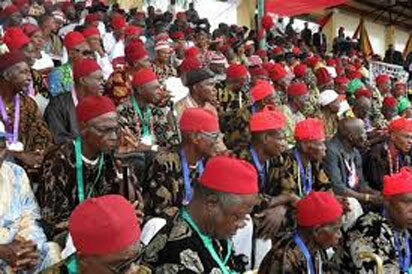 The apex Igbo socio-cultural group, Ohanaeze Ndigbo, has called on the Inspector General of Police to disarm armed Fulani herdsmen before ordering licenced gun owners to submit them to the police saying that without disarming Fulani herdsmen, it will be inappropriate to tell licenced gun owners to submit them in the face of terror and attacks on innocent citizens in all parts of the country especially middle belt and South. The statement read thus in part ‘Our main concern now is the Restructuring of Nigeria in sync with other progressive groups and individuals in Nigeria. Once Nigeria is Restructured , other things will fall in place. ‘We want a level playing ground for all sections of Nigeria. We want justice, equity and fairplay. We want a Nigeria in which the bountiful talents of Ndigbo and other Nigerians will be fully realized. ‘The nation as it presently constituted kills initiative. The President General of Ohanaeze Ndigbo Barr Nnia Nwodo assured Ndigbo that he and his EXCO are committed to protect the interest of Ndigbo at all times. ‘Ohanaeze Ndigbo alsdo called on the Inspector General of Police to disarm armed Fulani herdsmen before ordering licenced gun owners to submit them to the police. ‘Without disarming the armed Fulani herdsmen, it will be inappropriate to tell licenced gun owners to submit them in the face of terror and attacks on innocent citizens in all parts of the country especially middle belt and South. ‘Also, two Igbo groups Igbo Peoples Congress and Igbo Aborigines have lambasted the Inspector General of Police for his order to licenced gun owners to hand them over the the police within 21days. ‘The spokesmen of the group Okey Colbert and Chidi Obisike noted that this is a grand design to expose innocent Nigerians from the middle belt and South to massacre by armed fulani herdsmen who ought to be disarmed first before any such order is given, the noted. ‘They lambasted President Buhari for harboring a grande Fulani agenda and his unfortunate reduction of the killings in Benue , Taraba and Adamawa to a mathematical contest of the number of casualties.